As blogged in one previous post, I was one of the 50 winners of the Bring Back That Brand New Blogging Event. 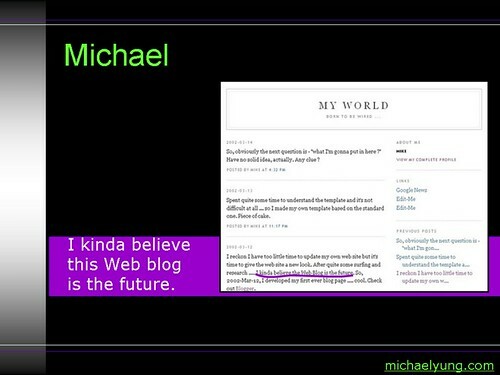 To enter the contest, I submitted a screen shot of my first blog post back in 2002 and the following winning line was selected by the organizer – “I kinda believe that web blog is the future”. The organizer also compiled those 50 winning lines in a set of presentation slides titled “This is the story of why we blog…”. Check out the whole set here in an interactive fashion. Previous Previous post: Where I am staying ?